Theme 3 | What is NATO’s Response? 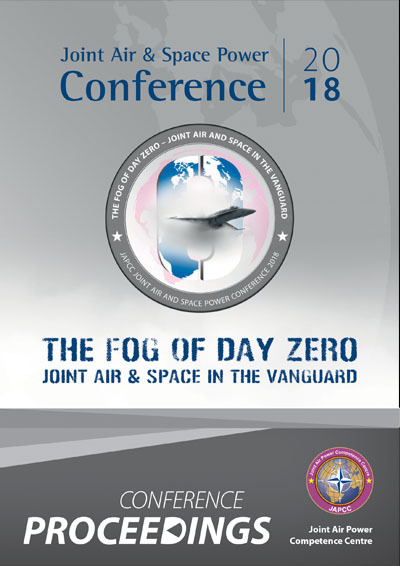 The third and final theme of the Conference centred on NATO’s Response, what can or should Air and Space Power do in the fog of Day Zero. ­Responsiveness means being able to swiftly execute pre-planned options because there is no time to initiate planning once the peer competitor attacks. Additionally, it includes when, where, and how NATO will respond. In 2018, the United States published a new National Security Strategy, ­followed quickly by a National Defense Strategy. In these strategies three lines stand out: a commitment to lethality, the importance of alliances and partnerships, and the acceleration of acquisition. The United States ­specifically highlights the two near-peer powers Russia and China, as well as Iran and North Korea, clearly indicating a shift in national thinking to more full-spectrum combat and the A2 / AD environment. At the same time, NATO held two summits with three key and recurring points: first, ‘NATO is a defensive Alliance’; second, the strategic concept of ‘collective defence, crisis management, and cooperative security’; and third, the ­reaffirmation that ‘as long as nuclear weapons exist, NATO will remain a nuclear Alliance.’ This sets the stage for the future environment wherein NATO must adapt to operate more effectively. During recent Summits, nations have agreed to increase their defence spending and to procure new systems. However, new systems alone are insufficient; more realistic training is required to ensure these new systems will be used most effectively. In addition to increased funding and additional training, several other recommendations were put forth to address emerging security challenges. First, NATO needs to develop a comprehensive list of indication and warning (IW) systems, driven by the political leadership, to focus the Alliance. Second, a standing mission should be initiated to fuse the information of all ISR assets – persistent, non-persistent, and episodic – to directly support these IW. Third, a standing, fully functional processing, exploitation, and dissemination (PED) architecture and a targeting centre need to be established to act upon the information gathered. Finally, NATO should establish a standing, fully manned Air Oper­ations Centre to ensure the proper command and control (C2) of NATO missions. This future C2 structure must be in place, trained and ready to act. These measures will ensure that all 29 Allies have the ability to use all necessary information and to conduct targeting as required. In the next decade a robust mix of 4th and 5th generation fighters in ­Europe should comprise the bulk of tactical Air Power of the Alliance, while different 6th generation systems are being studied, for operational fielding somewhere in the 2040s. The key to success is the ability of these weapon systems to interoperate. One of the critical systems is the data link that allow them to capitalize on their respective strengths when networked together in a multi-domain C2 architecture. Ensuring the reliability of the hardware, the integrity of the links between these systems, and the resistance of the command centres to interference is challenging. This ability will depend heavily on cyber and space-based systems. of service interruptions and recognition of malicious activity. NATO ­operations will be affected by the loss or degradation of space and ­electronic assets and, therefore, there must be alternatives to these ­capabilities when degraded or denied. NATO’s space capabilities must be protected and this can be accomplished in several ways. The first method is diversification. Reliance on a single system is risky, and single points of failure are key targets for the opponent. Global positioning system (GPS), positioning, navigation, ­timing (PNT), and precision delivery of munitions and manoeuvre all ­depend on GPS. The European Galileo system provides a similar service that has comparable accuracy making it a very good option for redundancy. Likewise, celestial navigation was commonly used before GPS and there is no reason why that technique cannot be used today in an automated manner. Inertial navigation provides yet another viable backup. Voice and data communications should not rely solely on space-based capabilities, but instead follow the ‘PACE’ philosophy which ­requires securing Primary, Alternate, Contingency and Emergency systems spread across space, air and terrestrial modes. Another element that establishes diversity, or dispersal, is proliferation. Where in the past we have relied on a small number of large and complex space systems, for practical and economic reasons, in the future we will employ larger numbers of small, inexpensive and easily replaceable spacecraft to provide NATO a more resilient space-based services posture. The second category is developing space systems and capabilities that can physically protect or even defend themselves. The next generation of missile warning satellites will contribute to their own defence, and integrate into a larger architecture that includes surveillance, IW, C2, and intelligence specifically designed to defend those space capabilities against attack. Thirdly, space systems must be enabled to defeat offensive activity. NATO must be prepared to find and destroy, or at least degrade, adversary ­offensive space systems when necessary before they can be used in an attack. This ability applies across every domain. The ability to do so will contribute to deterrence, especially when it is evident that NATO can ­respond in the time, place and manner of its choosing and not merely with reciprocal strikes in space. It is important to note that, while NATO depends heavily on space-based assets, many of NATO’s potential adversaries do not depend on space capabilities in the same way. A reciprocated attack on their space capabilities, therefore, may not have the same level of impact that is does on us. To help alleviate any ambiguity or questions, NATO should openly state in policy that it will respond to an attack on space assets in any way, and in any medium it deems appropriate. ­Creating uncertainty about the nature and severity of possible consequences can put potential adversaries at a substantial disadvantage that ideally is enough to deter aggression in space or any other domain. Offensive and defensive operations alone are not enough. NATO must also establish more rapid and effective cooperation in space. The United States is taking steps to promote this cooperation by making security classification guidelines more rational, reasonable and better-suited for combined, coalition and Alliance operations. Greater sharing will promote transparency that makes actions easier to attribute, and in turn influences nations to be less provocative, because they will no longer be able to act with anonymity. As we increase cooperation, space-faring ­nations will need to establish a set of agreed-upon norms for behaviour in space and be prepared to challenge those who do not adhere to these norms with the full diplomatic weight of the Alliance. In an effort to enhance response times, NATO is currently looking into the facilities and procedures available for aircraft cross-servicing and the use of Air Power in protecting reception, staging, onward movement (RSOM) and integration of reinforcements. In addition, modern technologies have blurred the distinction between the ‘front’ and the ‘rear’ in war, and, therefore, additional resources should include protection to logistical lines throughout NATO’s area of operations. As resources continue to grow within NATO, training should be focused on full-spectrum operations to include GBAD systems, degraded environments and the need for increased Strategic and Political participation. In the seven years since Operation UNIFIED PROTECTOR in 2011, exercises have been used to fix part of this paradigm, primarily in NATO Response Force training. Article 5 (collective defence) exercises have been, and in the future will be, organized like this year’s TRIDENT JUNCTURE in Norway and the North-Atlantic becoming more complex and directed at achieving a better understanding and being better able to deal with the uncertainty, complexity and ambiguity and how to cooperate with civil authorities. More time should be devoted to training to capacity and on the Alliance’s ability to operate seamlessly as a single entity. In future, politicians need to be involved in wargaming, not just within NATO but also in individual nations because decision-making and threat perception vary greatly from nation to nation within NATO. The speed of modern aircraft allows little time to form committees or hold meetings to formulate a response. Those responsible must be decisive and agile. Therefore, politicians should join in the training at the strategic level to better understand the challenges and provide pre-approved criteria and guidelines for action to military leaders where possible. In addition to dealing with threats from a Strategic and Political perspective, senior leaders should understand that Strategic Communications with both our populations and our adversaries are vital. Delivering the correct narrative will be critical to obtaining the public support vital to mission success. An additional problem is the lack of tactical level training. Training is historically conducted based on past experience, from predictable scenarios and seldom against realistic and uncertain adversaries that we predict will roam the future battlefield. To combat this, a system is required which constantly scans the operational environment and makes changes to exercise scenarios based on current and developing trends, and that helps define the blue force’s scenario and, thereby, developing Air Power more likely to be multi-domain, joint, combined, and inter-agency. In order to achieve battlefield superiority, streamlined decision making, realistic training and safe and secure lines of communication both in space and on the ground, it is important to exploit technology. The fourth Industrial Revolution will help innovate our operational logistics support enabling a ‘just-in-time’ supply chain. This supply chain will have a very small footprint, with spare parts readily available that do not need warehousing, and is achievable with little investment. Technology, for example, could also permit a maintainer, located anywhere, to send data to a 3D printer, perhaps collocated with an aircraft, to build required parts anywhere in the world. This same maintainer can then follow the maintenance or repair action virtually and even certify the maintenance actions using Blockchain. Industry plays a vital role in making this scenario a reality. One agency that can assist in leveraging technology is the NATO Industrial Advisory Group (NIAG). The NIAG is working on ways to speed up acquisition processes and is able to reach back to approximately 5,000 companies in various member states and provide advice with a turn-around time of weeks instead of months or years. This has the potential to help eliminate extended acquisition programs such as those for the Alliance Future ­Surveillance and Control replacement for the E-3A, and the NATO Air Command and Control System (ACCS). These systems share a flaw common in military procurement, the development and fielding takes far too long. In fact, many of the software engineers who conducted initial development for ACCS have already retired, which will present sustainment challenges going forward. The NIAG is more agile and accessible because it is already within NATO, so external contracting processes do not slow down work.